Numbers matching, L48/350 engine, 96,000 original miles, four speed manual transmission, power steering, A/C, AM/FM Radio, rally wheels, crank windows, white convertible top, headers, dual exhaust, Edelbrock aluminum intake, Edelbrock carburetor, and much more. We replaced the upper and lower control arm bushings, upper and lower ball joints, 4 shocks, idler arm, sway bar links, front brake calipers, front brake pads, front brake hoses, right front metal brake line, front slotted brake rotors, rear brake calipers, rear brake pads, rear brake rubber hoses, tongue bushing, strut rod bushings, trailing arm bushings, emergency brake cable, fuel tank, fuel tank sending unit, spark plugs, spark plugs wires, points and condenser, distributor cap and rotor, fan clutch, thermostat and gasket, pinion seal, coil springs, complete carpet set, fiberglass front bumper, and much more. We also rebuilt the carburetor and changed the oil and filter, transmission grease, rear end grease and additive, and checked and lubed the chassis. 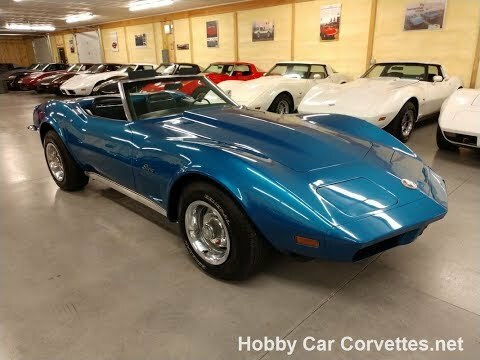 Only 4,943 convertible Corvettes were produced in 1973. This was the last year for chrome bumpers! For more interesting history of the 1973 click here.